There is nothing quite like a bag of fresh, solid creamy bits of Cheese Curds. Commonly called Squeaky Cheese by some, cheese curds are the solid bits of soured milk that are created during the process of making cheese. They have a somewhat rubbery, springy texture and if they are truly fresh they will make a squeak noise when they are bitten into. They have a mild flavor and taste a bit salty to some. Where to Buy Cheese Curds? Cheese curds are typically only sold and found near locations that have a cheese factory because of the way in which they are created. Ideally, they are eaten very soon after they are manufactured. Our cheese factory has operated since 1930 and remains one of the surviving niche cheese factories in the states. We’ve tried to make it easy for you to buy Cheese Curds for Sale direct from our factory. Cheese Curds are a delicious snack. 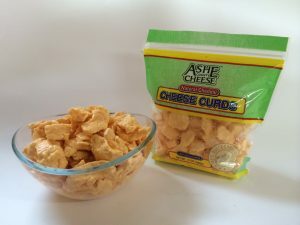 Click to purchase Cheese Curds for Sale from Ashe County Cheese Factory. Our historic factory creates cheeses in the Blue Ridge Mountains of North Carolina. You can buy a bag of these – find Squeaky Curds Cheese Kit to have fresh curds shipped directly to your door. If you are in the High Country area many local farmers stands, shops and grocery stores sell Cheese Curds for Sale that were made by our cheese crafters. Cheese Curds are great by themselves, served alone. They can also be paired with almost any herb or spicy meat like sausage. They are a primary ingredient in poutine dishes – which is primarily a Canadian dish – mainly served in Quebec. Anyone that has ever tried the cheese curds made by Ashe County Cheese will tell you that there is nothing quite like a big, fresh bag. Now you do not have to wait until a friend visits the mountains of NC to have your favorite snack. You can Order Cheese Online directly from us – including Cheese Curds for Sale.